Tagline- Twelve Terrorists. One Cop. The Odds Are Against John McClane. That’s Just the Way He Likes It. Released in 1988 Die Hard became not only one of the most successful action films, but one of the most influential and along with Lethal Weapon shaped the 80s and 90s action film and even in the following decades these two films are still influencing filmmakers. I always preferred Lethal Weapon, but Die Hard is no doubt one of the greats and I know this is a cliched saying, but they truly don’t make them like this anymore. Action films have become nothing except big explosions with little story and even less character development. If only more filmmakers would utilize the story and character aspects of Die Hard the action genre would be far better off. Die Hard actually quite an interesting journey to the screen as its based off a novel Nothing Lasts Forever, which was written by Roderick Thorp. In 1966, Thorp wrote the novel the Detective, which was turned into a movie by the same name in 1968 and starred Frank Sinatra. Nothing Lasts Forever was first published in 1979 and was a sequel to Thorp’s novel the Detective. There was an attempt to adapt Nothing Lasts Forever into a film, but nothing came about due to Sinatra passing on it. Nothing Lasts Forever was than adapted to be Commando 2, but when Arnold Schwarzenegger passed on the project it was rewritten into Die Hard. The script for Die Hard takes the basic premise of the novel, but seeing as the novel is a sequel and Die Hard its own films obviously changes has to be made. However a lot of aspects of the film remain true to the novel. Many actors were offered the role of John McClane with all passing until Bruce Willis accepted and at the time Willis was starring on the TV show Moonlighting and while a TV star he wasn’t a bankable film star and that all changed after Die Hard as Bruce Willis became one of the most successful film stars and became one of the top action film stars along with Sylvester Stallone and Arnold Schwarzenegger. John McClane (Willis) an NYPD cop arrives in Los Angeles to visit his wife over Christmas at the Nakatomi plaza where she works. A terrorist group led by Hans Gruber (Rickman) take control of the plaza and take hostages including McClane’s wife. Now its up to McClane to save the day. The screenplay was written by Jeb Stuart & Steven E. de Souza and its a truly great script. Die Hard is well plotted, but its the characters that drive the film and with such a great cast we get some of the most memorable characters. Stuart & de Souza give the characters their own identity and depth as almost all the characters have these great character moments and I really can’t think of many films that had the amount of characters Die Hard does and almost every single one of them have depth. While well plotted Die Hard as mentioned isn’t driven by it, but everything here is so well written that it adds depth to everything here. This is how you write an action film and the script by Jeb Stuart & Steven E. de Souza should be studied on how to structure an action film. 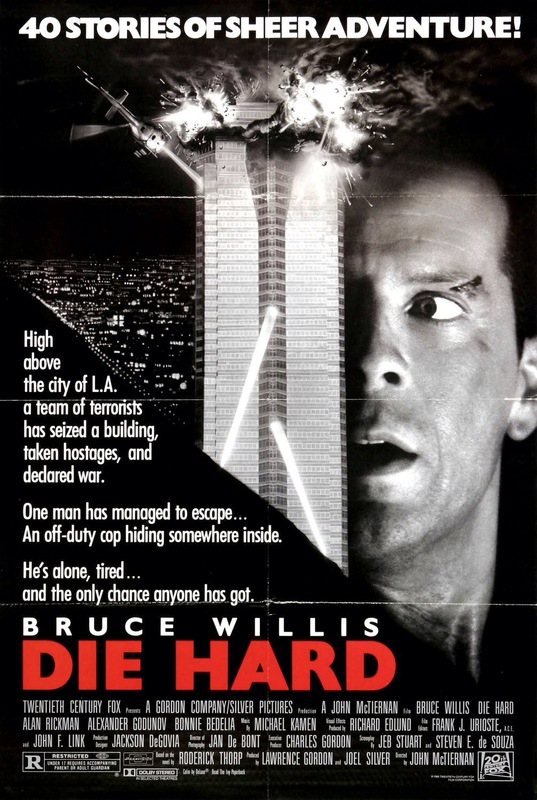 Die Hard was directed by John McTiernan who made his directorial debut with Nomads in 1986 and would than go into direct such films as Predator, Hunt for the Red October, the Thomas Crown Affair and McTiernan would also return to the Die Hard series with the 3rd film Die Hard with a Vengeance. John McTiernan has made some truly great films in his career and looking up his filmography he’s had plenty of success with perhaps the only real dud being Rollerball, but despite the success he’s had and despite what some hail as the greatest action film ever made with Die Hard he is also vastly underrated. As mentioned along with Lethal Weapon, Die Hard since its original release date has become the most influential action film. 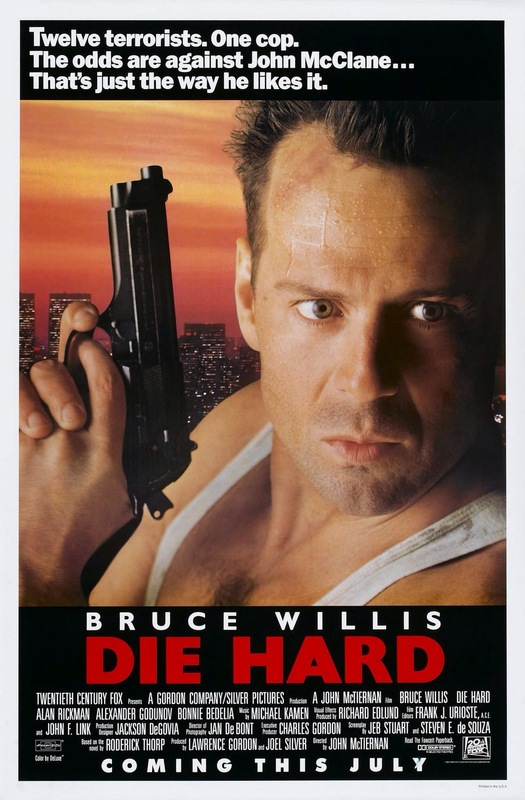 A lot of people dub Die Hard the ultimate guy film, which is fair, but in my opinion undersells the film as when I think of the so called guy film I think mindless fun and Die Hard isn’t just some mindless action film. It’s driven by characters and story and the action doesn’t really kick into roughly the 20-minute mark and even after that there’s still plenty of character moments to go along with the action. Die Hard is one of my favorites and while I personally wouldn’t rate it as my favorite action film it is however the one with the best structure on how to make an action film. Despite the 132-minute running time Die Hard is well paced and often quite exciting and McTiernan delivers some epic action scenes and Die Hard isn’t just a great action film, but a great film. What I love most about Die Hard is the truly terrific cast and one you would never see in a modern Hollywood film as nobody was a big Hollywood star, but instead Die Hard is basically filled with truly great character actors. Paul Gleason was in my opinion one of the very best actors of his time and he’ll be forever know as Richard Vernon in the Breakfast Club. Reginald VelJohnson who basically steals the show is another great character actor who is best known for playing Carl Winslow on the sitcom Family Matters. Than add in such actors as William Atherton, Clarence Gilyard Jr, Hart Bochner and Robert Davi and Grand L. Bush who would both appear together again in Maniac Cop 3: Badge of Silence along witn Paul Gleason and what you have is again a truly great cast of terrific actors. Alan Rickman made his theatrical debut with Die Hard and as mentioned at this time Bruce Willis was a TV star and any films he’d done prior he either had a small role or the film wasn’t very successful. Die Hard was a summer blockbuster and no way in the modern era would you have a cast made up of character actors regardless of talented they are and the hero and villain played by actors who aren’t proven movie stars. Die Hard is a wonderful film in terms of writing and directing, but the cast also helps elevate it. The cast may not be made up of big time Hollywood actors, but you’ll be hard pressed to find a better cast as every actor makes their part memorable including De’voreaux White as Argyle who doesn’t have a lot of screen time, but makes so much out of it Argyle was one of the best characters in the film. Overall Die Hard is a truly wonderful action film with an amazing cast and memorable characters. Die Hard is not only a classic action film, but a classic film and this one forever changed the action film.